The Sandwich Islands, from 1778 on, figured in all the voyages of exploration to the Northwest Coast of America. Going out from England or from Boston and New York, ships took in supplies at Hawaii. Likewise, on the return trip. Captains Portlock and Dixon in the King George and Queen Charlotte (they were on Cook’s voyage) made the trip to explore the fur trading country, sailing from England in 1783. In 1786-74 John Meares made a trip from India to the coast of America, probably Alaska, and returned to Canton by way of Hawaii. He then planned a second voyage for the fur trade and other purposes. Early on, no permanent settlements were made on the northwest coast; but a lively exchange of commodities took place on the decks of the trading vessels. They took knives, iron, copper pans, and trinkets from Boston, got furs for them on the Northwest Coast, completed their cargoes with sandalwood from Hawaii and exchanged everything for teas, silks, etc in Canton. John Jacob Astor was long engaged in this trade, and in 1810, for the purpose of securing such a control of that trade as to lessen the danger of rivalry by the Northwest Fur Company, he organized the Pacific Fur Company, and planned a permanent American settlement at the mouth of the Columbia River. Shortly thereafter, he went to the Islands and brought a supply of hogs, several goats, two sheep and some poultry to stock his base at Astoria – likewise, twelve Hawaiians signed on to work for three years. Vancouver, on his way out to explore the western coast of North America, provisioned at the Hawaii in 1792. From this time onward, American vessels, in their voyages to/from the Northwest Coast, frequently stopped at Hawaii for refreshments and repairs, and for the restoration of health to their crews, who became worn out by the long and stormy passage around Cape Horn and by the watchfulness and anxiety in guarding against the Indians when the ships were trading along shore. By 1840 there were between 150 and 250 English and American residents of Honolulu alone. There were a number of whites outside of this town. The Oregon country contained about a hundred families in the same year. Considerable trade between Oregon and Hawaii developed, the former sending wheat, beaver skins, salmon, and lumber to the islands and receiving in return sugar, molasses, tea, coffee and commodities brought there from China, England and the Eastern US. As an example of the business carried on, there appeared in the Honolulu Polynesian of August 31, 1844, an advertisement of Albert E Wilson, general commission merchant, Astoria, mouth of the Columbia River, offering to buy the products of the Hawaiian Islands and to sell merchandise and products from the Oregon country. “Sugar, coffee, indigo, tobacco, cotton and cabinet lumber will be the staple articles’ the islands would produce for export, along with yams, arrow root, hemp and raw silk. 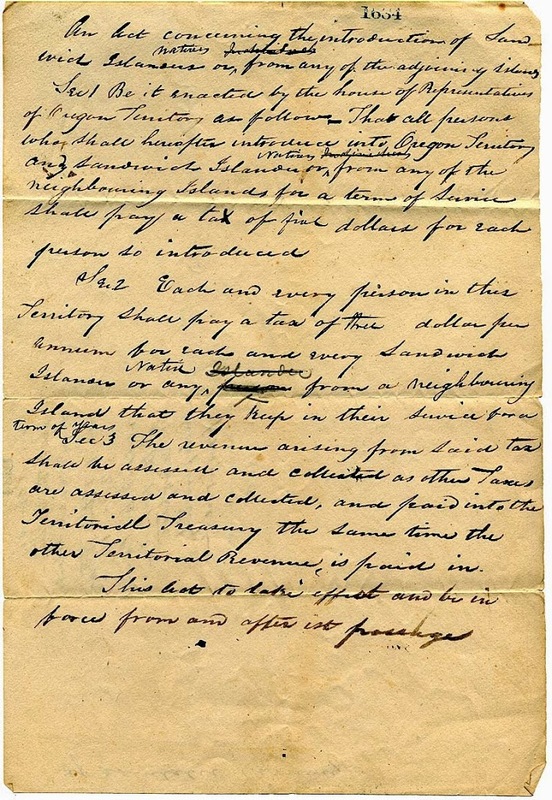 The existing trade between the Columbia River and the Sandwich Islands was evidenced by an advertisement in that week’s sale of the arrival for sale of 107,000 feet of lumber, 300 barrels of superior flour, 300 barrels of Columbia River salmon, etc. Coral brought from the Islands were used in constructing the ‘fort’ established at Vancouver on the Columbia River and in building chimneys for the settlers. The Oregon Territory stretched from the Pacific coast to the Rocky Mountains, encompassing the area including present-day Oregon, Washington, and most of British Columbia. Originally Spain, Great Britain, Russia, and the US claimed the territory. In 1819, under terms of the Transcontinental Treaty, Spain ceded its claims to the territory to the United States. Shortly thereafter the United States contested a unilateral Russian move to grant its citizens a fishing, whaling, and commercial monopoly from the Bering Straits to the 51st parallel. In 1823 President Monroe promulgated his doctrine, which put Russia on notice that the United States did not accept Russian attempts at monopoly. The US claim was based on the explorations of Lewis and Clark and on the establishment of trading posts set up by John Jacob Astor’s Pacific Fur Company, such as Astoria at the mouth of the Columbia River. Great Britain based its claim, in part, on James Cook’s exploration of the Columbia River. Early missions of the American Board of Commissioners for Foreign Missions (ABCFM) on the continent were to the Cherokee and Choctaw Indians of the southeast. Today’s ‘Timeline Tuesday’ takes us through the 1840s – first Hawaiian Constitution, the ‘Paulet Affair,’ Whaling and Great Mānele. We look at what was happening in Hawai‘i during this time period and what else was happening around the rest of the world.